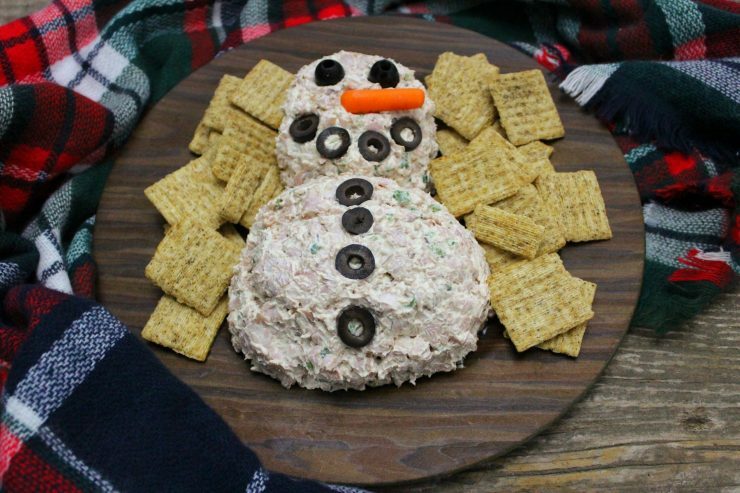 This Snowman Cheese Ball Recipe brings to mind a memory of Christmas Past. Come walk with me down memory lane to a small town in rural Oklahoma called Tahlequah. It was a cold and snowy evening; icicles glistened on the bare trees and the awning of the house as snowflakes lazily drifted down from the slate gray sky. Our Christmas tree was lit in red, green, and blue, and the stockings were bulging with surprises. “Frosty the Snowman” was pumping from the radio on the kitchen counter as I watched Mom cook. It was Christmas Eve evening and we were getting ready to head to Granny’s and open presents. The whole family always met at Granny’s on Christmas Eve for presents and appetizers and it was the highlight of the year for me! Mom was just putting the finishing touches on her Snowman Cheese Ball Recipe and Dad was loading the car. Oh the fun and excitement! The highly anticipated day had finally arrived; Christmas Eve at Granny’s house! We donned our Christmas sweaters (Mom always insisted we wear Christmas themed clothing on Christmas) and jumped in the car. It wasn’t a long drive to Granny’s since she just lived one street over and two houses down. We slid (quite literally) into the driveway, grabbed the Snowman Cheese Ball Recipe, the cheese dip, and the iced tea, and made our way inside. Granny greeted us at the door, wearing her favorite red apron and a big smile. As we stepped inside, the warmth of Granny’s house enveloped us in a warm hug. Burl Ives softly crooned “Silent Night” from the stereo in the corner, the smells of Divinity and Pecan Praline wafted out from the kitchen, and the lights of Granny’s tiny Christmas tree merrily twinkled. As more of the family arrived for the evenings festivities, the tree quickly became buried in a sea of brightly wrapped presents. As a child, the presents were the most exciting thing to me, but Granny always made us eat and visit first before tearing into the gifts. Although those days of Christmas Eve together are mostly gone, I will treasure the memories forever. It wasn’t the songs, lights, presents, or even the Snowman Cheese Ball Recipe that made the time so magical. The magic happened when we all came together as a family to celebrate our love for the Reason of this season, and our lives found in Him. Whatever brings your family together this Christmas season, I hope you take a moment to stop and remember the real Reason for this wonderful time of year. Are you ready to start making this Snowman Cheese Ball Recipe? I whipped this up in just minutes (literally) over the weekend so I know how fast and easy it is to make! Isn’t it just wonderful when you find an adorable but also fast and easy party appetizer?! 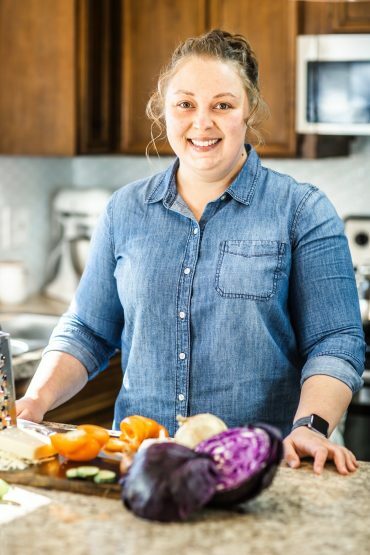 I know as a busy wife and mother I’m always on the hunt for fast and easy – especially during this time of year! You’ll wan’t to start out with 1 pound of Ham lunch meat. 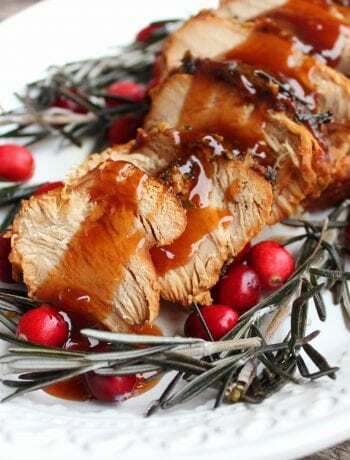 You can use any kind or brand of Ham lunch meat – I used Black Forrest Ham. 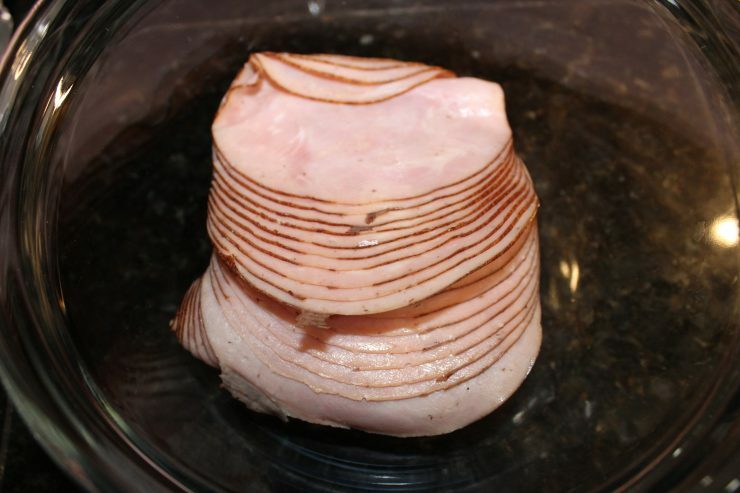 Place the sliced ham lunch meat in a large mixing bowl. Use a biscuit cutter to chop the ham into small pieces. This is a little kitchen hack I learned from my Mom years ago and y’all, it will save you so much time! If you don’t have a biscuit cutter to chop the ham with, just dice it up with a chef’s knife. 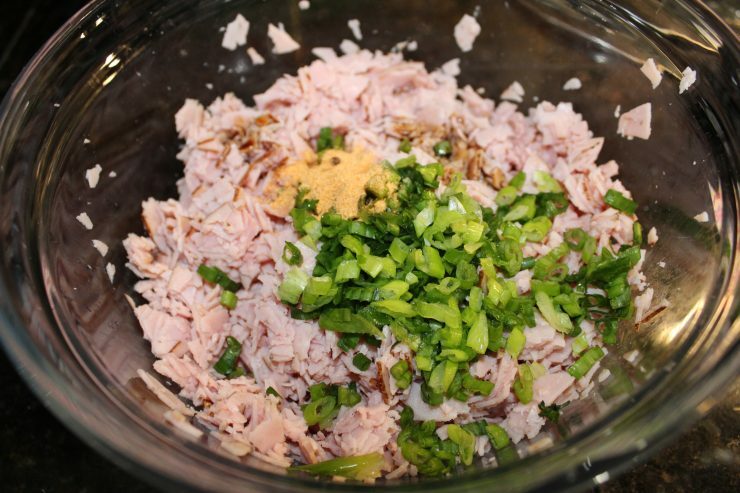 Now that the ham is nice and diced, add in 1 teaspoon Seasoned Salt, 2 teaspoons Worcestershire Sauce, and 4 green onions diced. It’s important to note here that we’re only using the green stalk of the onion and not the white bulb. Now, if you’re like me and you forgot to set 16 ounces of cream cheese out to soften at room temperature, you’re going to need a quick fix. Toss the cream cheese into a microwave safe bowl and heat it for about 15-30 seconds. You don’t want to melt it completely, just soften it enough to beat with an electric mixer. If you planned ahead and you remembered to let the cream cheese soften at room temp there’s no need to heat it. 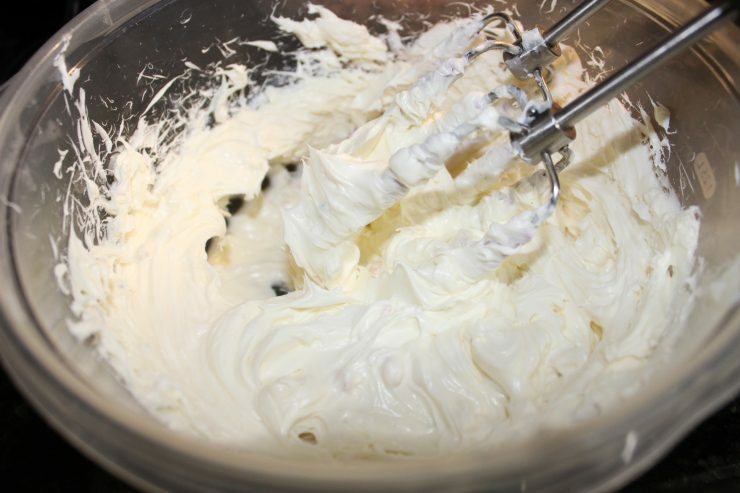 Once the cream cheese is in the mixing bowl, use an electric mixer to beat the cream cheese until completely soft. You want that cream cheese to be whipped and smooth with no lumps. 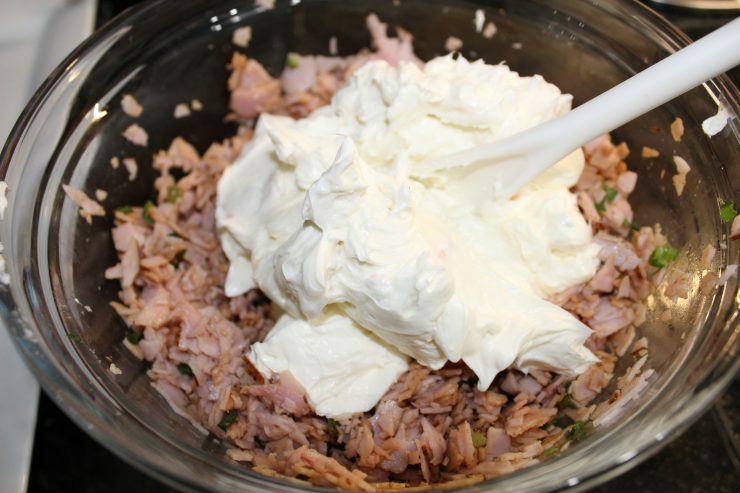 Add the cream cheese to the bowl containing the ham, onions, and seasonings. Be sure to scrape that bowl and get all of the cream cheese added in! Stir all of the ingredients together until fully combined and well blended. Grab a platter or plate and get ready to create this Snowman Cheese Ball Recipe! Spoon about 3/4 of the cheese ball mixture onto the lower half of the plate or platter and form it into a ball with your hands. Spoon the remaining half of the cheese ball mixture on the top half of the plate or platter and form it into a smaller ball with your hands. Now you have a snowman! Add sliced olives for the eyes, mouth, and buttons, and a small carrot stick for the nose. 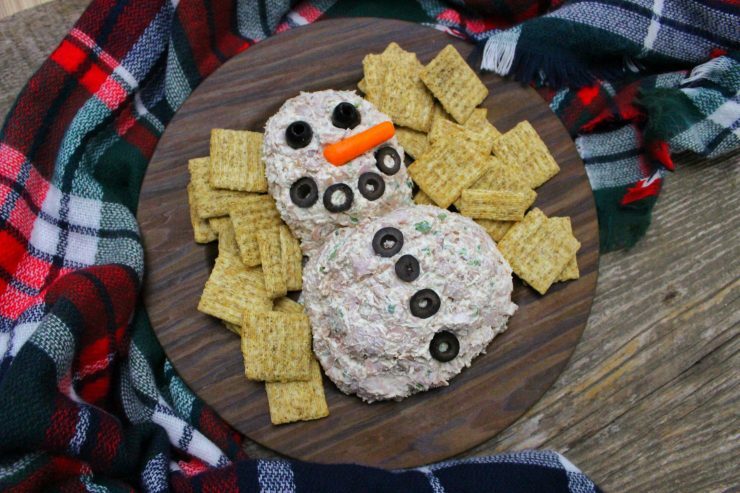 Serve this Snowman Cheese Ball Recipe with your favorite crackers and a cheese knife. This Blender Salsa is perfect for any party as is this Easy Spinach Dip. If you don’t mind doing a little cooking, this Easy Spinach and Cheese Calzone and these Pigs in a Blanket are also delicious. I hope you all have a wonderful and Merry Christmas this year! 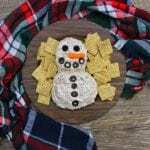 A delicious, fast and easy Cheese Ball Recipe shaped into a Snowman, perfect for Holiday parties! 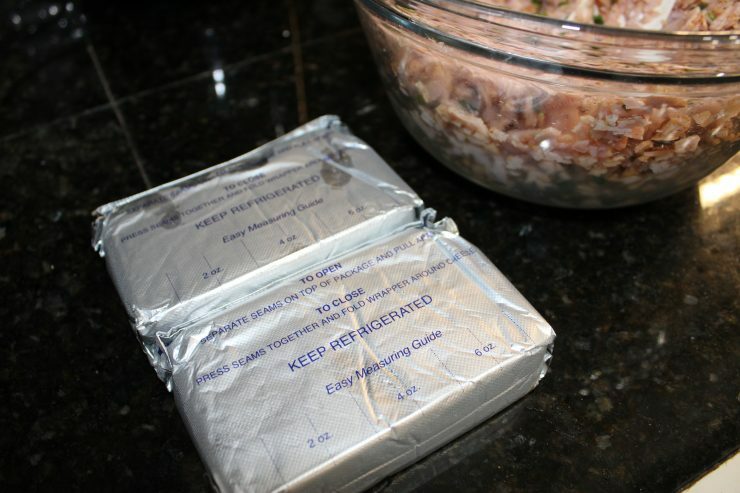 Allow the cream cheese to soften to room temperature or place in the microwave for 15-30 seconds to soften quickly. 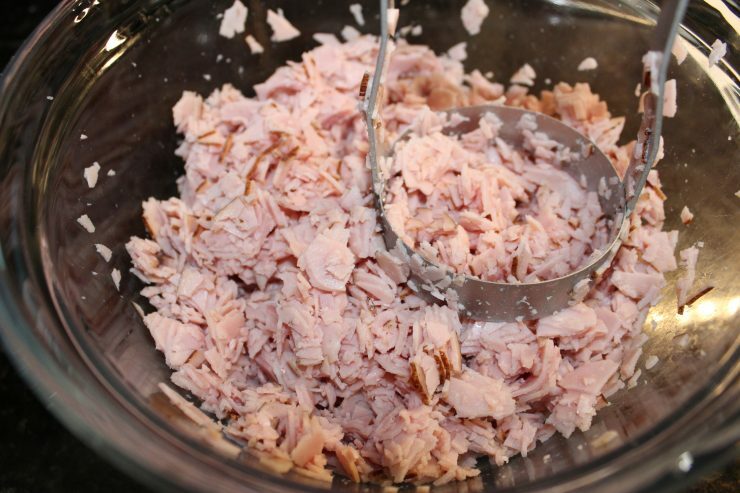 Chop the ham in a large mixing bowl with a biscuit cutter or chefs knife until it is in small pieces. Place the softened cream cheese in a large mixing bowl and use an electric mixer to beat the cream cheese until smooth. Add the cream cheese to the ham, diced green onion, Worcestershire Sauce, and seasoned salt and stir until well combined. 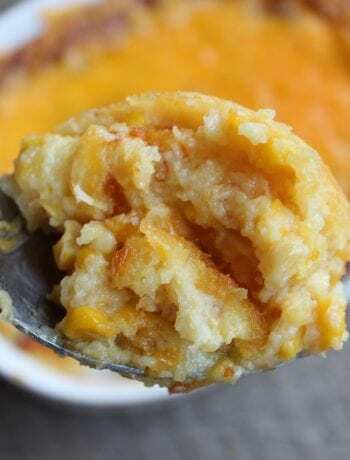 Use 3/4 of the cheese ball mixture to shape in a large ball at the bottom of a large plate or platter. Use the remaining cheese ball mixture to shape into a smaller ball and place it on top of the larger ball, forming a snowman. Use sliced olives for the eyes, mouth, and buttons and a small carrot stick for the nose. 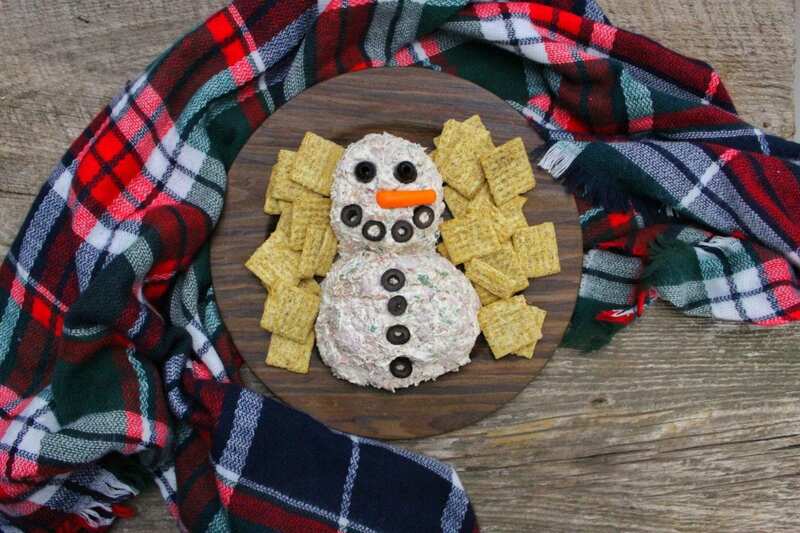 Arrange crackers around the snowman cheese ball and serve with a cheese knife. 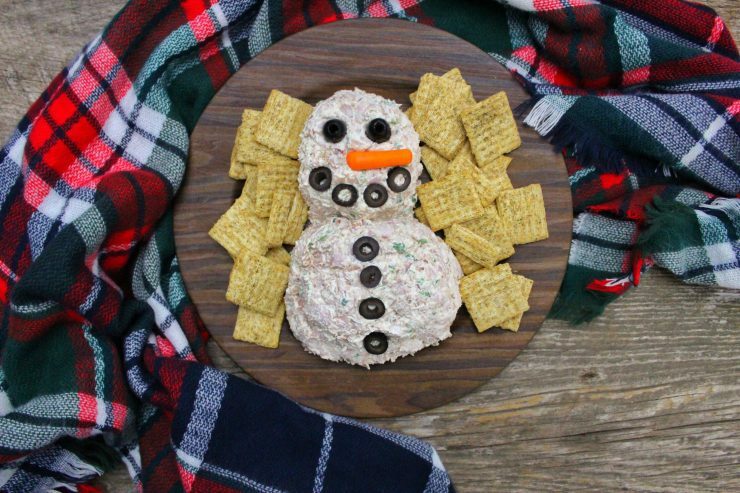 Your Snowman Cheese Ball is just adorable and will be very tasty! Hope you are enjoying your week and thanks so much for sharing with us at Full Plate Thursday! Thank you so much! 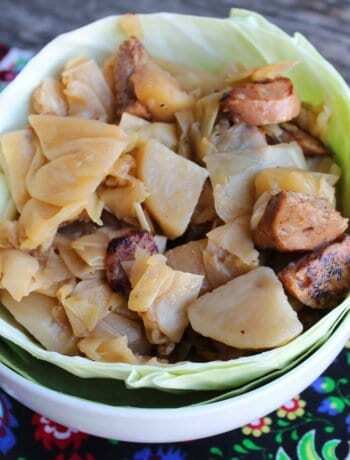 I love how fast and easy this is to make! Yum – a ham and cheese ball! I’m running way behind!! I wanted to make sure I stopped by to thank you for sharing at the What’s for Dinner party last week. Hope to see you there again this week!